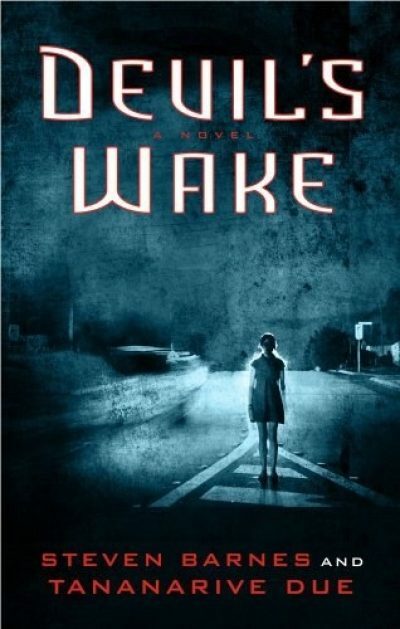 2012’s Devil’s Wake is the first volume in Steven Barnes and Tananarive Due’s Devil’s Wake series. It didn’t take long for the plague of angry ghouls to sweep across America, because to be bitten by one of the infected is to become one of the infected. There is no cure and there is no vaccine. The only reliable prophylaxis is preparedness or simple dumb luck. Given enough time, even the prepared run into something unexpected. Given time, the best luck in the world runs out. Kendra wasn’t prepared but her Grandpa Joe was. That was enough to keep her alive. It was not enough to save her father or her mother. A momentary misjudgment allows one of the infected to bite Kendra’s grandfather. The fungal parasite spreads quickly through his body; he barely has time to tell Kendra to flee to safety. The other protagonists (Terry, Piranha, Sonia, Darius, and Dean) got lucky. Offered the choice of consignment to the juvenile justice system or spending the summer herding kids (children, not goats) at Round Meadows Camp, the Round Meadows Five chose camp. That meant they had a safe refuge in which to wait out the apocalypse sweeping the US1… at least for a time. They are not sure that they will be able to survive winter in the isolated and unprepared camp, so head out in search of another refuge. Kendra and the Five’s paths soon cross. Joining forces only makes sense. Even so, there seems to be little hope. A few communities are still holding out against the infection, but they are not necessarily equitable or pleasant communities. Life out in the plague zone is worse. Bandits roam the roads, looking for victims, and the infected are everywhere. What to do? I am very uncomfortable with the decision the authors made to blame the plague on (in part) a dodgy batch of vaccine. The kids are not in a position to provide a bird’s eye view of the outbreak, but it seems to me that the apocalypse may well have been contained to the US or at least North America. No one manufacturer controls the vaccine market, even in the US. It’s at least possible nobody in other continents, or islands, was exposed to both the fad diet and the dodgy vaccine that combined to trigger the outbreak. It’s also possible that the fungal infection has a limited tolerance for cold. Because of the tight focus on the kids, it’s hard to tell if this book fits the Canadian pattern of post-apocalyptic stories (communities come together) or the US model (the whole world descends into anarchy). What we see is a little of both. The sequel presumably casts some light on the question. Many books have been written about zombie apocalypses. So many books, so few tropes. So it is reasonable to ask if this book stands out from the shambling, moaning crowd. IMHO, Barnes and Due manage to do so, in large part thanks to their choice of protagonists. While the Round Meadows Five may be petty criminals or have anger management issues, all of them—all six once they encounter Kendra2—will do their best to keep their friends and allies alive. They are essentially decent kids. A bit of sunshine in the apocalyptic gloom. Barnes and Due also avoid the clichéd suspense of picking off the kids one by one, just to convince us that anyone could die at any time. I did care about the characters, and I did worry about them3, but not because of cheap narrative tricks. 1: It’s never a good thing to be an adult in a YA book. Camp owners Vern and Molly are early victims of the plague. 2: Seven after they rescue Ursalina. I didn’t see how I could introduce her without giving away too much of the rest of the plot. 3: There was one character in particular I thought might be sacrificed to the Smurfette Principle; for much of the book, Sonia and Kendra are the only girls and Sonia was the one girl to be sexually active. I won’t tell you whether or not she survived, but I can assure you that her fate was in no way an exception.